Stefan Kienberger (Z_GIS) has successfully conducted a field trip to Mozambique within his PhD research to assess vulnerability to natural hazards (floods & droughts). Major objectives have been the identification of risk zones and additional geographic features with VHR-satellite images, identification of vulnerability factors (both through a participatory approach) and expert interviews. The results will be applied to model vulnerability on the district and community levels in Búzi, Mozambique through the integration of different datasets (census, Remote Sensing; weighting of indicators, ...). The research is funded through Munich Re Foundation. Further information is available following this link. Dr. Euro Beinat has been selected for the new endowed chair in 'Geoinformatics - Location Based Services' at Salzburg University. Starting from Jan 1, Prof. Beinat will be assigned to the Centre for Geoinformatics as well as to the Department of Geography and Geology and will offer classes and thesis supervision in LBS. The June 2008 summer school in LBS will be one of next year's highlights. Prof. Beinat's research is focussed on realtime location awareness, development of location based systems for highly dynamic and critical environments, and a social science perspective on dynamic cities. Current research initiatives are jointly implemented together with the SENSEable City Lab at MIT Boston and the SPINlab at VU Amsterdam. We are proud to invite your contributions to our annual conference “Learning with Geoinformation” (2.-4.7.2008, Salzburg) within the framework of AGIT ’08. We are now cooperating with both the Herodot Network as well as the GI-Forum to establish a full international track aimed at advances in education using geoinformation. Please find a first call for papers (German/English) at www.agit.at/schule or http://www.gi-forum.org/. See 'comments' for further details, and feel free to contact us for additional information! Approximately 450 pupils from several schools in and all around the city attended a stimulating program of interactive workshops and geo-games. On GIS Day = Nov 14 the Centre for Geoinformatics (Z_GIS) organised this event with several partners at Science City Salzburg. Highlights were navigation and caching games with mobile applications on cell phones, experiments with geological modeling, a satellite image quiz and a peek into the International Polar Year research program. Fascinated students left with a new image of Geography, GIS and location-aware technologies. Geoinformation for Development – Bridging the divide through partnerships. 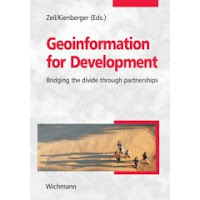 The new book publication “Geoinformation for Development” edited by Peter Zeil and Stefan Kienberger (Centre for Geoinformatics-Salzburg University) is now available. This volume provides a comprehensive insight to the timely discussion of the role of geoinformation in development cooperation and outlines challenges and obstacles and how they might be tackled. Scientists, actors in development cooperation and policy practitioners all have contributed aiming at a wider audience interested in this topic. The publication is available at the Wichmann Verlag or through Amazon.de. The Geoinformatics Forum Salzburg (GI_Forum) is scheduled for July 1-4, 2008, at Salzburg University, Austria. GI_Forum focuses on an international audience that shares an interest in Applied Geoinformatics. This Call for Papers aims at researchers who design, develop and apply advanced methods and techniques of Geoinformatics to a broad range of application domains. Energy for the Future” inspired by the United Nations “International Year of Planet Earth”. Global Monitoring - Observing, Understanding and Visualizing Planet Earth. Gudrun is currently a PhD student at the GIScience research unit from the Austrian Academy of Sciences. She received the prize for the best scientific poster: "Modelling spontaneous reforestation after land use and climate change" at the international Managing Alpine Future Conference in Innsbruck, October 15-17, 2007. GIS Day - counting down to Nov 14! Again, several hundred high school students will have the opportunity to glimpse through a window-to-science, to experience location-based technologies firsthand, and to participate in GeoWeb 2.o initiatives. Salzburg has always been a focal points for GIS Day activities, drawing schools from the city and from farther afield. As a special highlight, Z_GIS as the GIS Day organiser is collaborating with Salzburg Research to demonstrate tagIt - a social web application building the 'Salzburg Youth Atlas'. Program and contact details are available from the GISDay.at website. At and around Salzburg University, Austria research in GIScience has played an important role since the late 1980ies. Now the university's Centre for Geoinformatics is joined by the iSPACE research studio and the Austrian Academy of Sciences' GIScience research unit to form a cluster of institutions with a focus on geospatial research. This blog is dedicated to news from these institutions, pointing out events, research outcomes and educational offerings from these institutions. Comments by friends, visitors and passersby are always welcome - we appreciate input particularly from the wider GIScience community!